The Celtics extended their win streak to 3 games after beating the Jazz 98-93 last night at the Garden. Rondo only had 6 points before leaving in the 2nd half with a hurt ankle. They said that he could come back but didn’t want to risk it. He did record 10 assists so he is still in the chase of the record, but did not hit the 11 mark. 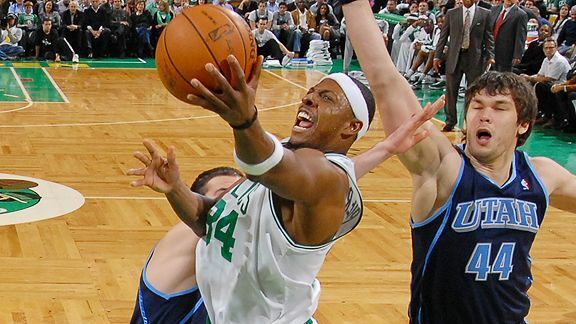 Paul Pierce continued to show he can still play with 23 points, including three 3-pointers. Jeff Gr een stepped up big and put up 16 points in 27 minutes, while Garnett added 11 points, 8 rebounds, and 4 assists (one of which is worth watching if you check out ESPN today). He tossed it behind his back to Barbosa and it looked like he knew he was going to before the ball was even near him. Speaking of Leandro Barbosa, talk about a great pick up. He hit 6 out of his 8 shots and put up 16 points while recording a game-high +13 points. The weirdest part about this game for me was that Jason Terry didn’t take one 3-pointer. I know it doesn’t matter since we are winning, but we are gonna need some outside shooters when we play bigger teams like the Lakers. The Celtics play the Nets tonight in Brooklyn at 8 p.m. This entry was posted in Celtics and tagged allen, basketball, boston sports blog, brooklyn, celtics, Garden, garnett, jazz, jefferson, nba, Nets, pierce, rivers, terry by christoph131. Bookmark the permalink.